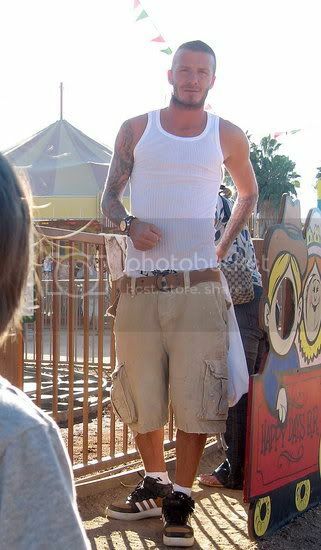 The Beckham bunch headed to the pumpkin patch in LA yesterday to pick up last-minute Halloween treats. The one thing I envy about LA is the heat. Today in London was the coldest day of the year, but here is David looking like it's mid August wearing a white tank top and shorts. I love to see they enjoy family activities like this. The Beckham ads — shot by Mert Alas and Marcus Piggott in Los Angeles on Wednesday — will be unveiled for the spring season, and are part of Armani’s global underwear push for Emporio Armani. Victoria said the timing quite literally couldn’t be better for an underwear campaign. "I started running regularly about a year ago and when this campaign came about, I began working harder every day," she told WWD from the shoot. "And this morning I got on the treadmill and said, ‘OK then — this is my last chance!" "It’s a huge compliment being asked to be in the campaign and to be part of the worldwide campaign for Emporio Armani underwear," she added. "It’s really exciting to me. Mr. Armani is a lovely person and his team is fantastic, so it’s a really exciting project for me to be involved with. And hopefully they will see a huge response." "Marc Jacobs is a genius and a good friend of mine, and now, to do Armani, is an honor," she said. "I first met Mr. Armani at a store launch in Paris when I was there with Katie Holmes a few years ago. He is incredibly charming. I have so much respect for Mr. Armani and the whole company. To be given this opportunity to work with them is thrilling." 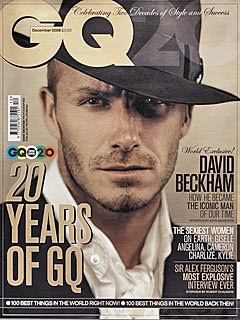 "David’s pictures were fantastic," Beckham said. "He looked gorgeous in them. I was very, very proud and happy for him. He looked amazing." Before the announcement of David moving to Milan Victoria said. "Nothing has been finalized as yet, but if we do go, it will literally be for two months, because the season finishes here in L.A. and David will go to train with AC Milan. We are so supportive, myself and the children. It’s a great opportunity for him and we are very excited about spending time in Milan." Victoria Beckham knows the Italian fashion capital, and has several friends there. "It would be a wonderful experience for the family," she said. "Obviously, I will be very busy at that time as well, because I will be preparing to show my next collection in February in New York. I have so many friends there, and my experience of Italy is great. I love it there, and it’s great for David." "We love America, and there have been lots of reports saying that we are moving from America," she added. "We are not. This is where we live. It is for eight weeks, and we’re excited about that. I will be spending a lot of time there and so will the children. The children are big boys now, and they go to school, and will continue their education here in L.A., and we will travel about so we will all be together as a family, but it’s not a permanent move." And while she is there, she is sure to breathe in some of the fashion spirit that permeates the city. "The best thing you can give a designer is the ability to travel and experience different cultures, countries, and so for me, it’s huge." I am very happy to hear that she is going. I was shocked when it was reported that she was not going to go with him. David's loan move to AC Milan is now official and the LA Galaxy captain will join the Italian club in January. An agreement has been reached between the Los Angeles Galaxy and AC Milan for the loan of David Beckham effective in January, 2009. David Beckham remains under contract to the Los Angeles Galaxy of Major League Soccer and will return to the club for training and the start of the 2009 MLS season. AC Milan and the Los Angeles Galaxy have additionally agreed to a technical partnership that will provide great benefit to the L.A. Galaxy. Call me cynical, but I from that last line, to me it means that the Galaxy will profit in some way from the move, e.g. they will get a slice of the shirt sales. Fox News are reporting a start date of 7 January. Can't wait. I may even take a trip to Milano. Here are the other pictures from Victoria Beckham's Vogue India editorial. The wig looks much better in these shots, and I really like the first two. It has been reported on The Daily Stab - Not a reliable source I know - that Victoria Beckham is now following Katie Holmes' footsteps and is reportedly planning on running in the 2008 New York City Marathon this Sunday. Apparently Victoria has been training for this weekend’s big race and hopes to complete the run that Katie finished last year with a final time of 5:29:58. "It was meant to be a big secret. She’s been training for months with the main goal of running in the New York Marathon. But, if she doesn’t feel ready, she’s planning to do the one in Los Angeles in February next year…"
No disrespect to my girl Victoria, but I do not believe this for one second. Girlfriend does not even like going to the gym and hates wearing sneakers, how would this ever work? Well at least the article made me laugh. 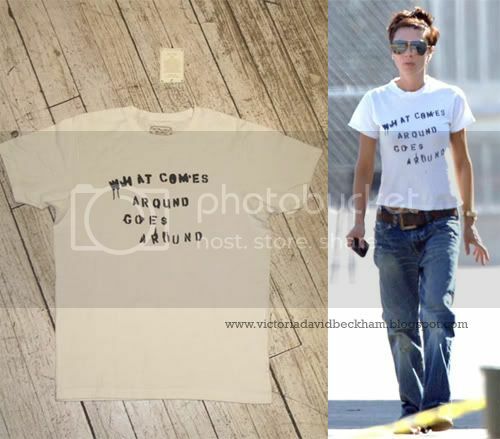 Thanks to t.o.CityGal and baconbuttiespice, who confirmed I was right to identify Victoria Beckham's t-shirt from What Comes Around Goes Around. You can buy this Stencil T-shirt online for $58 in a cream colour. I am going to read it now. Enjoy. So, the MLS season is over for the Galaxy. Unfortunately we didn’t get the win we wanted to end the season with on Sunday, but we played well and showed the right commitment and spirit, so the signs are very positive for next season. On Monday the club held an event on Monday for the season ticket holders who come out to watch the Galaxy win, lose or draw. It was great to meet so many fans and spend time talking to them. They are incredibly passionate about the club and deserve success, which unfortunately we couldn’t give them this season, but they are positive about the future and hopefully next year we can really give them something to cheer about. I know there’s been a lot of talk recently about the possibility of me joining AC Milan on loan in January during the MLS break. One of the reasons I want to train and play in Milan for a few months is the fact that the MLS season doesn't run as long as the European season and having played most of my career in Europe, my body has been trained and geared not to have that amount of time off. Obviously, I will be honoured to be given the chance to train and play with the likes of Ronaldinho and Kaka, but it also gives me the chance to keep my fitness up and carry that on for when I come back to the Galaxy for the new MLS season. Of course, nothing is confirmed yet, but there’s already been plenty of talk that I’ve bought a house out there and that I’m buying a jet, none of which is true. I will let you know when it happens. Next season is an important one for the Galaxy. We haven’t been in the playoffs for three years now and for a team like LA Galaxy we all know that isn’t good enough. Bruce Arena will also have had the chance over the past few months to get used to the squad and, with his experience and previous success, he’ll want to make sure that we’re up there competing next year. After a successful run with David Beckham as his Emporio Armani underwear model, Giorgio Armani announced today that Victoria Beckham will be the new worldwide testimonial for Emporio Armani Women's Underwear. OMG, I could not be more excited. Mert Alas and Marcus Piggot will shoot the star for the spring 2009 advertising campaign. "Who better than Victoria Beckham to launch our new global Emporio Armani underwear campaign?" said Armani in a release. "Victoria is a style icon, a dynamic lady whose influence and recognition will add great excitement to the continued international growth of our Emporio Armani women's underwear business." This has come from Armani's press office, so this is official people. David Beckham was one of the many celebrities supporting the LA Lakers kick off the NBA season. I am so happy, because that means we will get to see many pictures of David court-side. Also there were longtime Lakers lovers Leonardo DiCaprio, Kevin Connolly, Denzel Washington, Governor Schwarzenegger and Tobey Maguire. The Lakers defeated the Portland Trailblazers so David and co, would have been very happy. But can't scan it until later, as I am at work. Check back around 7pm UK time. It will be worth the wait. Update: I will have to scan the magazine much later as I now have a press event to go to this evening. Sorry. 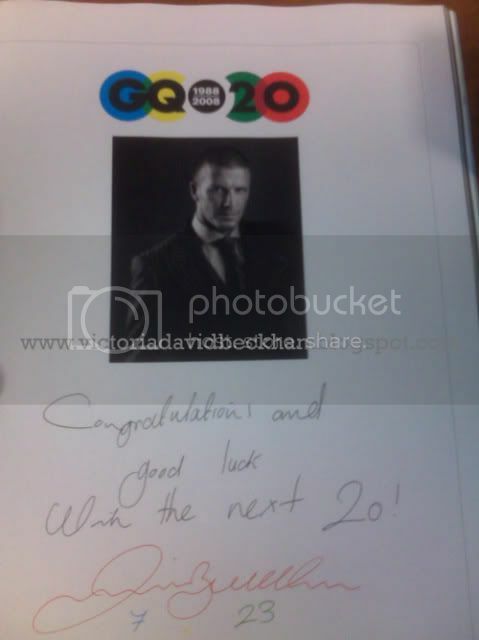 Here are some scans from OK magazine, which is a behind the scenes look at the Beckham's ad campaign. Victoria Beckham fit right in with the other soccer moms, as he watched Brooklyn's soccer game in LA yesterday. Wearing baggy jeans, a 'What Comes Around Goes Around' t-shirt, flip-flops and a cute headband. In other news, it has been reporeted that Victoria has already been offered $16 million to host a documentary about her soccer ace hubby David Beckham’s move to AC Milan. Personally I can not see that happening. Who Wore Christian Louboutin For Rodarte Better? David Beckham To Train With AC Milan or Arsenal?